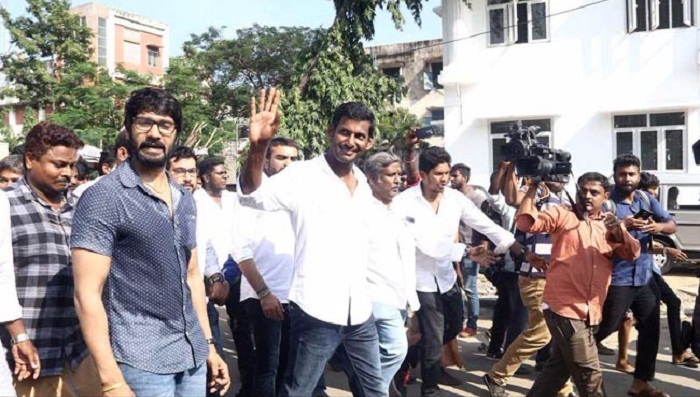 Actor Vishal Krishna, popularly known by his first name, and J Jayalalithaa's niece Deepa Jayakumar will not contest the by-election for Tamil Nadu's RK Nagar assembly seat, as their nomination papers being rejected Tuesday. Officials said Jayakumar had failed to fill several columns in her election affidavit, while two of the 10 people who proposed Vishal's nomination were found not to be residents of Chennai's RK Nagar as is required. Vishal briefly sat on a dharna outside the office of the election officials in RK Nagar, before police made him get up and leave. The field is still crowded with big names for the by-election to fill the seat left vacant by the death of former Tamil Nadu Chief Minister Jayalalithaa exactly one year ago today. It's a prestige battle for the ruling AIADMK which needs to retain the seat to prove that it is not in complete disarray after its powerful leader died. It has fielded a senior leader, E Madhusudanan, as its candidate. Madhusudanan has represented RK Nagar before in the state assembly and is seen to have influence among Telugu people, who make up a sizeable chunk of voters in Chennai constituency. The AIADMK will not miss Jayakumar or Vishal in the fray. Both could have cut into the party's votes, Vishal because he is popular among the Telugu voters as he's from Andhra Pradesh, and Deepa Jayakumar through any emotional association for voters as Jayalalithaa's niece. The party will no doubt seek votes in the name of Jayalalithaa or Amma as she was known to her millions of fans and supporters. On her first death anniversary, party leaders and workers led by Chief Minister E Palaniswami, Deputy Chief Minister O Panneerselvam and other ministers paid tribute to their leader, many of them dressed in black. Madhusudanan faces sidelined AIADMK leader TTV Dhinakaran, who is contesting as an independent candidate and the DMK's Marudhu Ganesh, an RK Nagar local who is seen by many as the front runner. The DMK wants to win RK Nagar to deliver a big psychological blow to the AIADMK and bolster its claim that the ruling party has lost popular support after the death of Jayalalithaa. The main opposition party hopes for a favourable verdict in the 2G scam case against its top leaders MK Kanimozhi and A Raja. A court in Delhi said today that it will announce verdict on December 21, the same day as the by-election. Dhinakaran was appointed the AIADMK's deputy chief by his aunt VK Sasikala, who was then party chief, as she left for jail in a corruption case in February this year. They were both evicted by the party when the two factions led by Chief Minister Palaniswami and former CM O Panneerselvam merged in August. Dhinakaran and Sasikala have challenged that decision and claim to lead the real AIADMK, though their support in the party is dwindling. Madhusudanan's big advantage in the by-election is that he gets to contest on the AIADMK's famous two-leaves symbol, with the Election Commission recognising the united AIADMK as the "real" party and de-freezing the symbol. The BJP has fielded a candidate too, while Left parties and the MDMK are supporting the DMK. The RK Nagar by-election was to be held in April this year, but was cancelled amid allegations of voters being bribed. At that time then, Dhinakaran was the AIADMK's official candidate and Madhusudanan was the rebel, fielded by the O Panneerselvam camp.